The FFA post-secondary instructor toolbox is your place to find links and tools for chapter administration including: roster management, managing your profile, tax documents and other forms and tools. Looking for lesson plans and other materials for the classroom? Try looking in Educator Resources. Please, read through the instructions for declaring/certifying CDE and LDE participants. Access 35 folders dedicated to providing resources for teaching and promotions centered on CDE pathways. Tax documents to create or maintain alumni chapter tax exempt status. The LPS team is a liaison for state staff and teachers. Each specialist works with states within their territory to provide technical support, answer questions, and provide assistance as needed. Contents vary by event - May include written exams and keys, practicums, official placings, resource materials, topics and years best examples of student work. Videos and FAQ guides on measuring members for the perfect Jacket fit. A total program assessment according to the Council’s standards for a High Quality Agricultural Education Program. Use the PDF or contact your state staff to obtain access to the online tool for teacher interns. 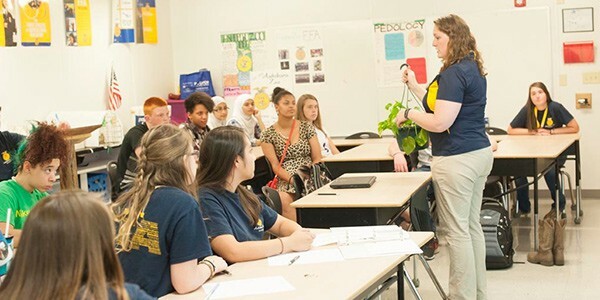 The National Council for Agricultural Education has an electronic survey tool to analysis of the overall health of the agriculture education program, create a growth plan, determine priorities, and build an action plan to enrich specific aspects of the local program. 2018 National Convention & Expo name badge and registration guide. New FFA advisor or transitioning to another chapter? Begin the approval process to receive administrative access to your chapter. Once approved, you will be able to manage your chapter’s roster and profile, as well as review and submit Gift of Blue applications for students, certify national CDE teams, access the chapter application center, and see the local Alumni roster. In 2018 we have moved to a new declaration/certification system. The historical reports (2017 & prior) are available here. Searchable knowledge base and help system for working with your roster system. Including how-to's on common tasks like: invite codes, adding members, submitting your roster and more.